Wilma Lois Baker, 78, loving widow of Jim Baker passed away on January 27, 2019. She was born in Richmond, KY on August 19, 1940 to the late Joe and Hazel Dennis. Wilma was a loving wife, mother and sister who dedicated her life to taking care of her family. She is survived by her sister Joann Greer and three daughters Joanna L. Baker, Tracey C. Rowan and husband Tim, and Cindy D. Baker. In addition to her daughters, she is survived by six grandchildren Shannon Dutta and husband Jay; Rachel Kennedy and husband Shannon; Samantha Spalding; Taylor Spalding; Michael Rowan; and Edward Rowan; and her six great grandchildren Mya, Eli and Lilly Kennedy; Jay, Alex, and Elly Dutta. Wilma was the founder and owner of the The Cheesery delicatessen for more than 25 years. 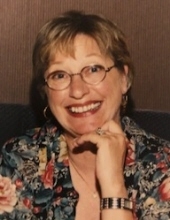 In addition to enjoying time with her family, she was an avid reader, she loved to travel with her late husband of sixty years and wintering in their Florida condo. She especially loved the many years they spent boating with friends on the Kentucky River. Wilma’s family was blessed to have her for 78 short years. She was an amazing, strong, and selfless woman. She always put her family’s needs before her own and consistently told her loved ones “love you more”. Her strength and love will continue to enrich her family. While they will miss her terribly, they find comfort in knowing that she and Jim are together again in heaven. In lieu of flowers, expressions of sympathy may be made to the Bluegrass Care Navigators or a charity of choice. There will be a Gathering of Family and Friends to honor Wilma’s life on Saturday, February 9, 2019 from 4 - 7 pm at Clark Legacy Center, Versailles Rd, Frankfort. To send flowers or a remembrance gift to the family of Wilma Lois Baker, please visit our Tribute Store. "Email Address" would like to share the life celebration of Wilma Lois Baker. Click on the "link" to go to share a favorite memory or leave a condolence message for the family.